A powerful, easy to use, non-destructive Mesh and Material Merger Tool. This tool makes it possible to combine groups of objects into a single or small groups of objects in order to improve the performance of your games without sacrificing your workflow. It also allows for the creation of merged LODs by re-using already existing LODs from the original objects, and controlling the percentage of objects included in each LOD and minimum size each object needs to have for each LOD. – Preview merged statistic results before performing merge generation. – Any Shader. Keywords can be enabled when using Material Merger. – Easy to work with and to change objects even after merging them. – No skinned meshes support. – Keep raw GameObjects active with their renderers and LODGroups disabled in order to keep custom components. Assets are game-ready, containing 3 LODs per asset. Create detailed and efficient scenes in minutes! Object Construction Kit is designed to allow developers to quickly and efficiently create detailed scenes with ease. After the scene, or part of a scene, is ready, the OCKit generates combined objects with levels of detail for greater performance. This asset also includes an Atlas Tool, that allows creating, editing and managing several atlases at the same time. All assets in the videos and images are included with Object Construction Kit. 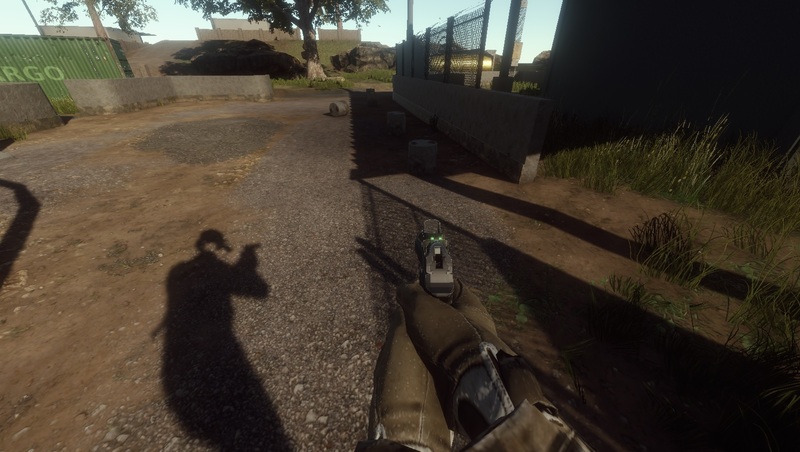 First Person View is an asset that allows you to have a First Person Perspective where first person objects do not clip through the environment, have a separate field of view from the environment and can receive shadows from the environment. 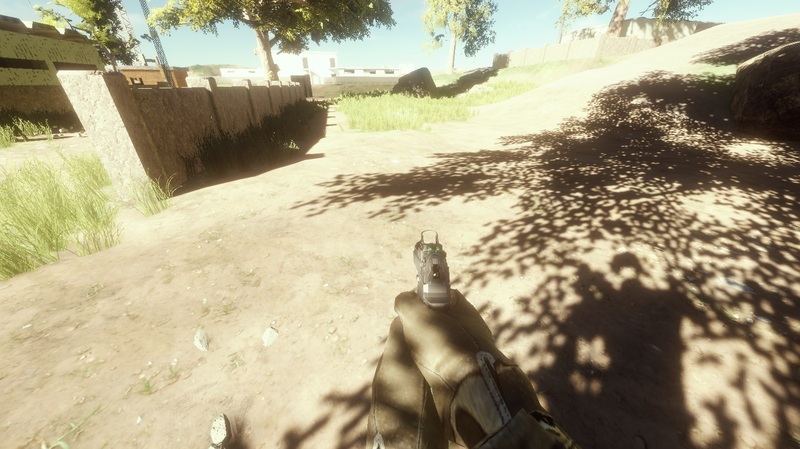 Removed First Person View Layer requirement. It’s no longer needed and should be done on a per project basis. Removed FPV V1 solution (Multi-Camera solution), because it does not work with Unity anymore. V2 is a superior version and much more efficient. Motion Vectors are partially supported. It “resets” the buffer, but in my tests i don’t see any issue. Contact me if any issues occur. Welcome back to a new development blog! This week i got a lot of feedback after testing No Heroes with a few more people. For starters, i was able to remove any signs of mouse smoothing that there was in the player input. This was caused by how the system was setup with the networking middleware i’m using. Now, the player input is very responsive and much better to control. In addition, i also improved aiming down sights speed and movement consistency. I also added two options for mouse sensitivity and aiming sensitivity. These options are now in the same menu as the video options, but will later be put into another menu. I also made a second pass at the graphics options and post processing settings, and updated what each option affects and how the option affects it. The game is now more consistent and performs better with lower graphic settings than before. Improved the footstep system by being able to play more sounds per surface. Every surface also received completely new sounds, about 5 new sounds per surface. I also improved all firing effects, hitmarks effects and sounds of weapons, which can be seen in the video in the next section. To add more realism, the character no longer rotates under their feet. Instead, the feet stay in the same position until the player rotates enough, that an animation is triggered and moves the feet to their original place. To better improve the visuals, i spent some time tweaking the lighting and tonemapping by better using HDR. Now the colors and light feel much more consistent, and the transition between light and shadow look much better. I also tried some new techniques to better improve the overall terrain on slopes and some parts of the map that looked ugly. More types of grass, new rocks and new plants were added to the map. Made a new pass on assets and map performance by reducing some textures resolution where the change has insignificant visual results, but saves on VRAM usage. Plus, i reduced many spec/metallic texture resolution, since these are really not noticeable. With this, i saved around 50-100 MB of VRAM and saved some milliseconds. 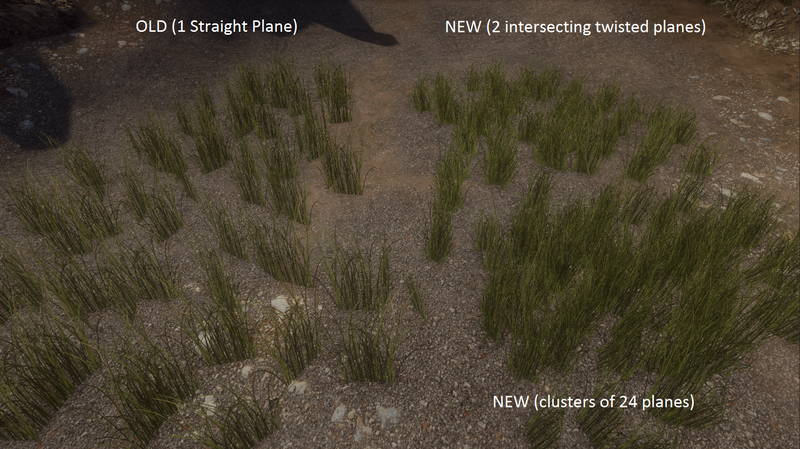 Improved SpeedTree performance by unchecking some costly properties and improving their LODs distances. Some player algorithms were also improved, along with more intelligent remote networking updates and client-side prediction corrections. Noticed around 20FPS improvement on my machine with these changes. There are still a lot of places to improve performance that will be worked on next. The remote player was also improved, with smoother movement, more consistent events (vaulting, climbing) and the same lower body mechanism described earlier. Now, when a player kills another one, their weapon also drops to the floor and can be picked up by other players. As miscellaneous updates, i spent some time re-organizing the project folder with a more practical hierarchy, and also removed many unused assets to decrease project size. Since i have have the server play in a window, i had to set it up in a way that it doesn’t consume many resources, so i improved the server performance a lot by reducing plenty of unneeded computations, graphics, frame-rate, and more. It’s now very light in comparison to what it was before. And, as always, many bugs were fixed, but probably many are still hidden in between the cracks of the code. Thanks for reading and for the amazing support! Starting this blog with something major, i added lag compensated hit detection on the server. This makes it possible for when players hit a player or some other thing, that action is also correctly performed on the authoritative server. To easily test this, i implemented a target system where the target moves in a line back and forward in a similar way the player movement works. This allows for accurate hit detection testing. To see if everything works, when the target gets hit on the server, the red light turns on and it rotates backwards. If it’s hit on the client, the green light turns on, but doesn’t rotate backwards. You can see that without lag compensation, if the player hits the end of the target, in the opposite motion, the hit never happens on the server. And if the player shoots in front of the target in motion, the hit happens on the server. This time i also fixed the problems about the aiming down sights. For some reason it was behaving frame-rate dependent, even though its algorithm wasn’t frame-rate dependent. I was able to fix this issue, plus the smoothness of turning it on and off. One other issue i was having with this, was that with long-range scopes, the scopes were stuttering when the player moved or rotated. Now all these issues are fixed and working properly. You can see this in the video above. This was actually partially added in the last blog (which i forgot to include), but now, i added more types of these decals to the bullet holes with better lighting, and decals around the map. Two more things were fixed/added to the game. Now, at the end of the game, the match winner is displayed, and i also improved the spawning system of Deathmatch game mode by choosing the spawnpoint that has the biggest average distance to all the enemies. This works pretty well for deathmatch. A couple of weeks ago, i announced that i defined the last ToDo tasks that need to be done before the next Video Development Update #46. I had to add just a couple of important new ones, which were already completed. I also updated the whole Trello board with a more organized look. Now it’s much easier to see the tasks , and which ones are the priority. That’s it for this development blog! Welcome to the new Development Blog #5! So, i thought i got this fixed, but turned out it wasn’t. It was working properly, but when i tried debugging the movement with induced lag, it started behaving very weirdly. Moving, jumping, falling were full of micro stutters, vaulting and climbing were not behaving correctly, and so on. As everyone that works with networking will say, networking problems are the worst. With that, i was able to fix the issue, and now the player controller is very smooth and better than before. Now, all testing is done with induced lag, so i can test how the game plays in reality. For this update, i decided to replace a lot of the old objects i was using in the map with new and better quality objects. In total, there were more than 30 new objects that were added. I used Blender for 3D modelling, and Substance Painter 2 for textures. With these new props, the map now looks and feels much better and detailed. You can compare these images with ones from previous blogs, and you’ll see a very big difference in quality. If you follow me on Twitter ( @Tiago11F ), you might see some posts that i make showing new things in the game. These are usually small stuff, so i just post these on my Twitter page instead of other platforms. I also made a new tool that greatly improved item placement. This tool projects each individual part of a single mesh onto the terrain, so nothing is left in the air or inside the ground. Regarding the next version of FPV2, i fixed some inconsistencies with first person shadows, and also fixed the weird things that i was getting with this setup on the editor scene camera and other cameras. This new update is still work in progress, so i don’t have an ETA for it yet. With all these updates, i should probably talk a bit about the next video development update. Things are progressing well, and i feel like the next update is almost on the way. I wanted this update to feel like a new game and feel a lot different in comparison with Update #44. There’s been so much work done that it really does feel like a new game. I was thinking of making a small video for this Development Blog to show the improved character movement, animations, sounds, map, etc, but i decided not to spoil too much until the next update, so it can feel fresh. That’s it for this development blog. A lot more work has been done on other things, but don’t feel like those should be included in these blogs. Thanks for reading and for your awesome support! Welcome back to a new development blog of No Heroes! Starting things off with First Person View, i decided to figure out how to fix the shadowing issues and lighting due to how this system works (very short z-buffer for first person objects with custom projection matrix (independent FOV)). Because of that, shadows were almost an on/off effect, and lighting was also on/off. Remember, first person objects don’t clip through the environment and have a separate field of view, much like any modern shooter. This allows changing the field of view without distorting the player models. To my knowledge, i haven’t seen this achieved in any Unity made game yet. Jumping onto the terrain, i switched a few textures to new ones that give a much better quality to the terrain. 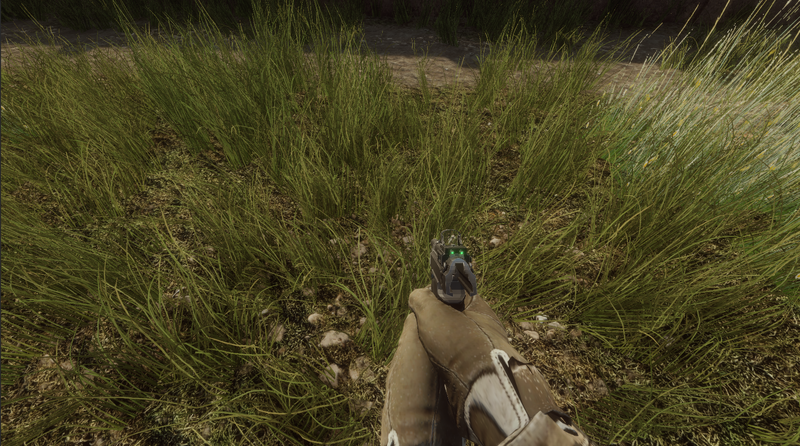 The new grass and dirt textures make the grass feel like it’s part of the terrain. Overall quality also increased, with higher resolution textures and new speedtrees placed on the environment. One thing i noticed when testing the game, was that the movement wasn’t always fluid. This was due to the movement and smoothing being made on the fixed-update methods (constant slower frame-rate), due to the networked controller predicted movement. Now, a smoothing algorithm is performed on the Update method, that smooths out the players movement in relation to the actual frame-rate of the game, making everything feel much smoother. Until this update, when a player died, the ragdoll would remain in the game until the end. Now, each client is allowed only one ragdoll during the game. Just yesterday, i was messing around the environment, and one thing i noticed the most was that, except for the grass and trees, it was too static. Using the asset ShaderForge, i made a shader that simulates low level wind on the objects. The effect runs on the GPU, so it’s not very expensive. It still has some improvements to give a more natural wind effect, but by adding wind effects to certain objects on the environment will make it feels much more real. This effect already has the option for exclusion mask, wind texture, wind speed and deformation amount. Last but not least, i was able to improve certain sounds in the game. I added the ability to have more than one footstep sound per surface and fixed the loud noises it was causing. 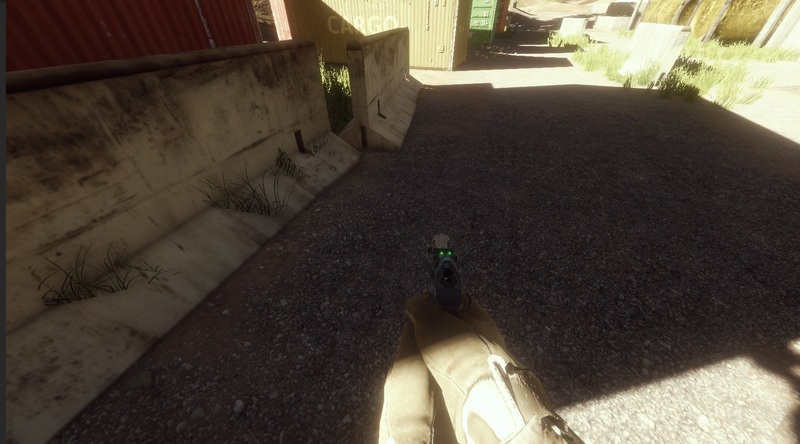 New footstep sounds were also added, plus new gun sounds for firing and handling it. 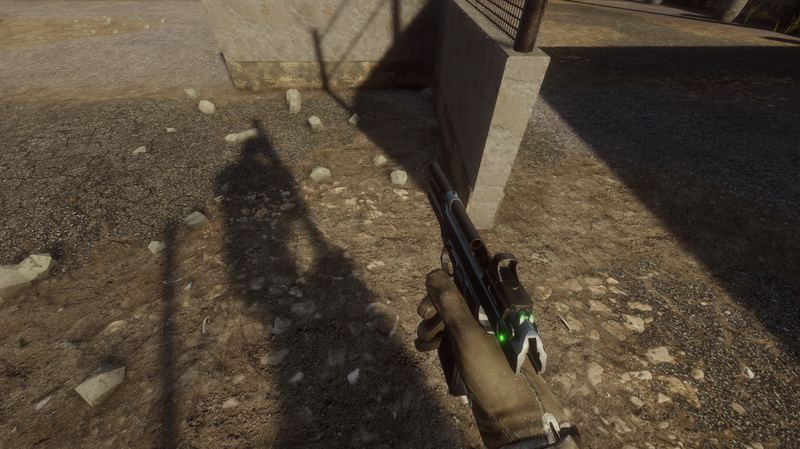 At the moment only the pistol has new sounds, but more will be added to other guns. In addition, I ugraded the Unity version to their latest Unity 5.5. Performance improvements and general looks improved by making this update. Many other things were worked on, like improved networking performance, bug fixing, player movement, classes structures, textures, and more. Well, that’s it for this development blog. Thanks for reading it and hope you’re liking the progress! Also, take into account that this is a hobby project of mine, and i don’t work full-time on it, so it’s not unusual for updates to take some time. First of all, this blog was delayed a couple of weeks because i had to prepare and defend my masters thesis, which i passed 🙂 . Because of that, i wasn’t able to spend much time on the game and make a development blog. With that done, here’s what has been worked on No Heroes since last development blog! 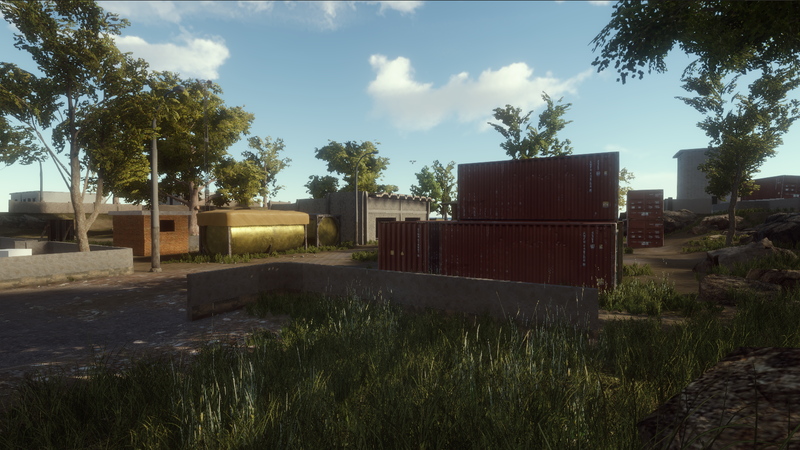 For this weeks blog, i focused on two things: Improving the map and fixing an important issue with slow player spawning. Starting with the map and visuals, as you remember from some old images and from last blog, there were some odd and ugly buildings in this section of the map. To improve it, i made a few new ones with better materials. 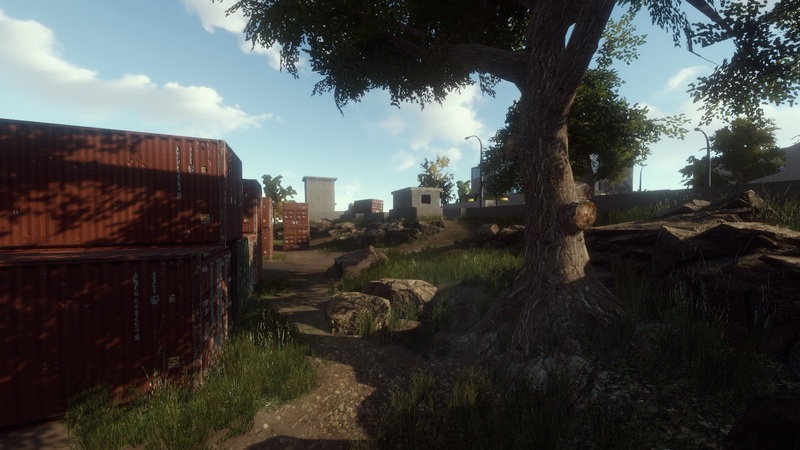 New objects, small walls, grass, and trees were placed around the map. This was one tough thing to fix. The spawning of a new player, with weapons, attachments, animations, etc, was so heavy that there was a close to 1 second lag when a new player spawned. I was able to decrease that cost to something that isn’t noticeable, which is fantastic, but will still need to be reduced even more. Might not seem like a big deal, spawning a player, but with all the systems implemented in the game, it is proving to be a more difficult task than previously thought. The dynamic movement of the weapon was also changed. It wasn’t very natural, and was hard to aim when rotating the player around. A very straight forward thing that exists in every game is the out of bounds. Like was explained in last blog, an out of bounds effect was implemented, and now the server actually kills the player after a few seconds of being out of the game zone. Making everything consistent in a multiplayer game is probably the most difficult thing to achieve. 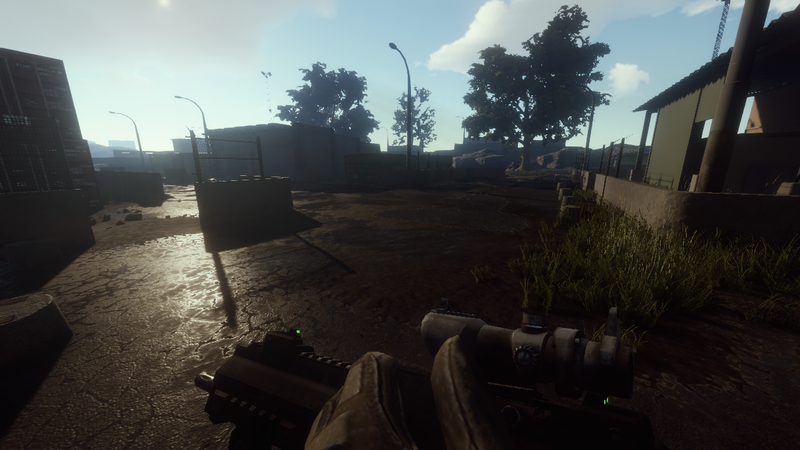 For this development blog, i also spent a lot of time trying to make the game more consistent, like gamemode setup, destruction state synchronization, weapon/attachment assignment, bug fixes, etc. Thanks for reading and for the support! A lot of things have been done and improved since last blog. From better AI that shoots at players to optimized and consistent player spawning, initial work on screen-space health effects, improved visuals and details on the environment and a lot more! Until now, there was no visual feedback that a player has been hit, so i implemented a few effects based on the health the player has and if the player has been hit by a bullet. The effect based on the health changes the screen to black and white and the corners of the screen imitate an heart beat indicating the player is low on health. The hit feedback can also be seen on the video, where the gun flicks when the player is hit. One thing i didn’t include in the video is the out of borders effect. It gradually increases the bloom effect and adds a grain effect to indicate the player is out of bounds of the play area. Last blog i implemented AI controllers, but they only walked around the map doing nothing. 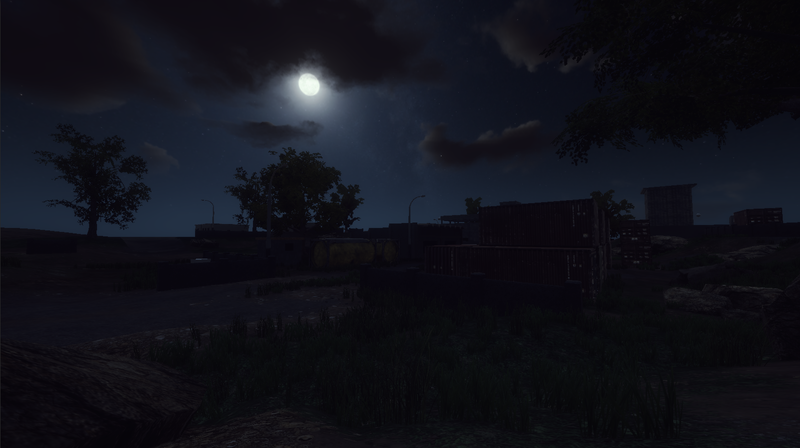 This time, the AI players can walk/run around the map, and if they spot a player, they will shoot at them. To be able to easily test things, i made them shoot only once a second. That way i can see if everything is working right. The whole AI controller is also more consistent than before. The AI can be seen in the video above. Before making the next video update of No Heroes, i also wanted to improve the visuals, 3D objects, textures and a few other things. Not too much but enough to look much better. For the sky system, i’m using uSky. It gives very high quality results with really good performance. Day and night got a lot better. I also modified many colors, mainly on the terrain, but also on a few models. Added more details like small/big rocks, trees, and others. The grass was also pretty bad looking, so i decided to improve it. Watched a few videos to see how to do better grass, and tried out a few things. I was able to greatly improve the quality of the terrain by modifying the grass as it can be seen in the images below. 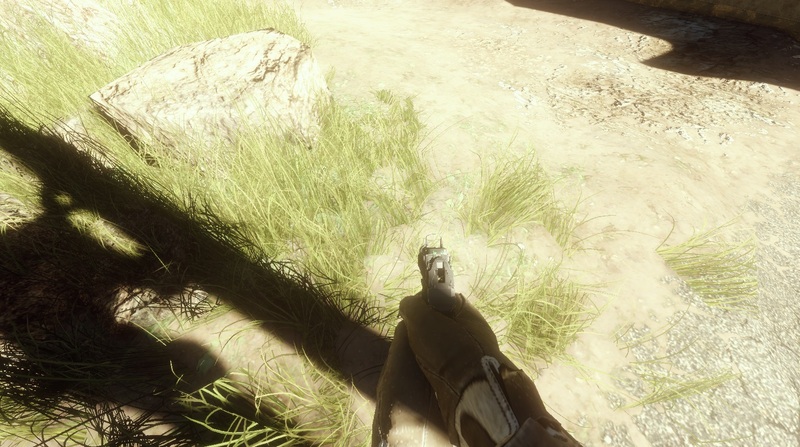 One other thing that impacted the visuals quite a lot was cloud shadows. By adding a cloud texture to the directional light cookie slot, it simulates cloud shadows. it’s not entirely correct with the sky, but it’s not very noticeable. And that’s it for the second development blog. There were a lot of other things worked on like behind the scenes stuff, consistency issues resolved, performance optimizations, new 3D objects, textures, etc.